It is said that the Getty Center in Brentwood, Los Angeles is less a museum with artworks inside, than an artwork with a museum inside. 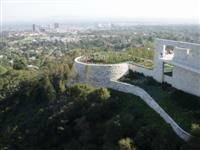 Certainly the building, designed by Richard Meier and costing $1.2 billion to build in 1997, is celebrated for its architecture and gardens, while the wonderful views over LA are breathtaking. With over 1.3 million visitors, the Getty Center is one of the most visited museums in the USA, and it is well worth allocating a day to explore. It houses a premier collection of pre-20th century European paintings and artworks, and a leading archive of photography from the 19th and 20th centuries. The most famous work on display is undoubtedly Irises by Vincent van Gogh, although there are hundreds of other notable works, including Paul Gauguin's Arii Matamoe. Transport: The Getty Center is served by Metro Rapid Line 761, which stops at the main gate on Sepulveda Boulevard. Opening times: Tuesday to Friday 10am-5:30pm, Saturday 10am-9pm, Sunday 10am-5:30pm. Closed Mondays.